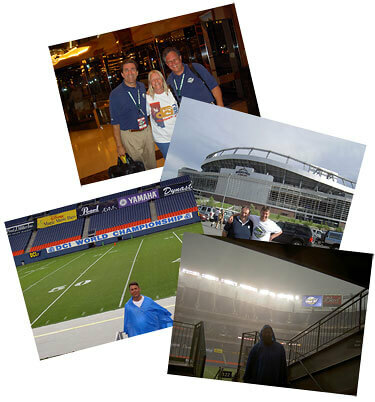 Wendy and Richard Isaacs of Bath, England, sent these photos from the 2004 season. Here are some pictures from drum corps fans in the United Kingdom during our visit to the DCI World Championships in Denver, Colo., in 2004. I managed to accost two drum corps legends (Steve Rondinaro and Dennis Delucia) in the lobby of the Adams Mark Hotel for a picture. The next picture is of my then boyfriend Richard and his mate Pete who marched together in the UK way back in Roman times. The final two pictures show a rather bedraggled boyfriend in an empty stadium due to a sudden downpour. I don't know what's wrong with you Americans; it's only a little rain. Try marching in England! It was a memorable trip for us. After Denver, we drove out to California to see the additional performances during the DCI Tour of Champions. On the way, we stopped off in Vegas and got married at the Little White Chapel! We've made the trip to the States together to see the DCI World Championships every summer since we've been together (1995). We took a break in 2006 to spend some money on our house but will be returning in 2007 to attend the East Coast shows in July.